Things at The Painted Lady have gotten back to normal, or as normal as things can be at a Vegas tattoo shop. That is until Brett Kavanaugh and her crew take in a drag queen show that ends in one of the stars, Britney Brassieres, getting popped with a champagne cork. Britney recovers only to die suddenly a day later. Brett's new employee Charlotte, a good friend of Britney, is on the run and she wants to know why. What was Britney involved in to make someone want her dead and what does Charlotte know about it? The answers may revolve around a tacky Queen of Hearts broach, a piece of jewelry everyone wants to get their hands on, especially the people with the matching tattoos. 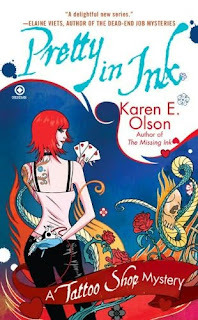 It's hard for me to convey the plot of a Karen E Olson mystery to people and Pretty in Ink is no exception. Things start with an odd occurrence that ends up with someone dead and things just snowball from there. There are twists and turns that I never see coming. I did have one problem with Pretty in Ink. I enjoyed getting to know Brett in The Missing Ink and I expected more from her in this book, I guess. She lost some of her oomph for me. There was another character (a potential mate?) I liked getting to know more of and hoped that he and Brett would get it on. Maybe next book? I hope Brett finds time for a little bit of romance. Pretty in Ink is a lot of fun with a plot that keeps you guessing. I recommend it for a quick and entertaining read. After reading the Tattoo Shop Mysteries, I end up thinking about the kind of tattoo I'd get if I were brave enough. Something literary, I think. How about you do you have a tattoo? If you don't, what would you get? Once again the cover art is gorgeous! Disclosure: Karen E Olson sent me Pretty in Ink for review.